Clean the dandelions: remove the thick part of the stems and gently tear the leaves into bite size pieces. Wash them and dry them very thoroughly. Put them in a big bowl that you can toss the salad in. Prepare the leeks: I used the chop first, rinse second method, and then took them for a spin in the salad spinner to dry. It worked great! Use white and light green parts only and chop faily small - I quartered the leek and cut 1/4 inch strips. Put a large pot of salted water on and get it started for poaching the eggs, add a splash of white vinegar to the pot as well. Crack each egg into an individual dish. Now cook the bacon in a skillet until crisp. Remove it to drain and turn the heat to medium. I didn't remove any fat from the pan but bacon differs - if you have a deep layer of fat in the pan maybe remove a little. Add the leeks and cook them until they are quite soft. Turn off the heat and add the vinegar, stirring to get the good bits up off the pan. Pour the leeks and all of the liquid into a small bowl, grind some pepper in and add the oilve oil and maple syrup. Whisk the dressing and taste - mine had plenty of salt from the bacon but add more if you need it. Also test acidity, you may want another splash of vinegar. Crumble the bacon onto the greens. 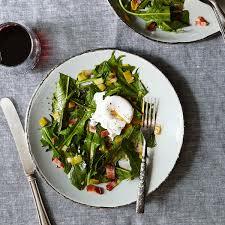 Toss the warm dressing with the dandelion greens and bacon. Poach the eggs: slide each one into the boiling water and let them poach for 3-4 minutes. While they are poaching go ahead and toss the greens a few more times (the warm dressing will wilt them ever so slightly) and then portion them onto 4 plates. Make sure that each plate gets equal amount of bacon or fights will break out. Top each salad with a poached egg, grind a bit more pepper over the top, and serve. Enjoy the springtime!! !